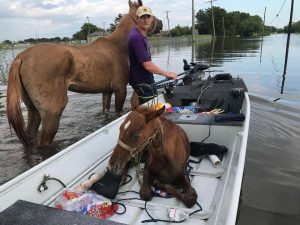 In addition to being equipped for the “normal” emergencies associated with breeding and racing Thoroughbreds, Florida horse owners need to be prepared to handle the fury of a tropical storm and/or hurricane. Each farm should have a well thought out plan of action developed far in advance of threatening storms. Mitigation – Activities which eliminate or reduce the chance of occurrence or effects of a disaster. For example, using hurricane clips to reinforce a roof. Preparedness – Being ready for the emergency that cannot be avoided or prevented. This includes training employees. To respond effectively, employees must know their responsibilities and have access to necessary equipment. Notification/Warning – This stage could last for several hours such as in the case of a hurricane or only a few minutes when responding to a tornado. For example, notify employees when and where to meet. Immediate Safety – Search and rescue as well as providing emergency medical treatment for people and animals. Property Security – Do fences need immediate repair? Has debris blocked access to vital areas? Do windows or doors need to be boarded up to prevent further damage? After Care – How will horses be cared for until the farm is back to “normal”? Damage assessments should be made during this phase. Restoration – This stage involves the “outside” assistance and includes repair of utility services. Nothing is as “good as new” during restoration, but at the end of this stage people begin to see the farm can return to “normal”. Recovery – This stage continues until all facilities and operating systems return to normal. Long-term recovery as in the case of destroyed buildings may take years. Recovery planning should include a review of opportunities to lessen the impact of future emergencies. Install a hand pump on farm wells. Well water will not become contaminated unless it is submerged by floodwaters. Avoid damage from flying debris. Tie down and/or secure everything you can. Turn over and tie down anything too large to store. Get mobile home tie-downs for livestock trailers and other vehicles. Move vehicles into the middle of the largest open areas away from trees and tie them down. Have on hand a box packed with halters, leads, tape, rope, tarps, fly spray, and animal medical supplies. Keep in your house. Have on hand in the house: several hurricane lamps, lamp oil or kerosene, fire extinguishers, batteries, battery operated radio, matches, gasoline, and chlorine bleach. Keep two-liter soda bottles filled with water in the freezer. They can be thawed in the refrigerator when electricity fails to keep the refrigerator cold and be used as a water source when thawed. City water becomes contaminated when purification systems are inoperable. To purify water, add two drops of chlorine bleach per quart and let stand for a half-hour. Fill any large outside vessels (rowboats, canoes, feed troughs, etc.) with water. This keeps them from becoming debris and provides a source of water for animals after the storm. Pool water and collected water should be kept chlorinated so it remains usable. Shut off main electrical breakers and close gas and water valves. Unplug appliances and turn off air conditioning. Chain propane tanks to the ground with tie-down stakes and label them “propane”. Label any other hazardous material containers. Bring chain saws, ladders, axes, shovels, metal cables, block and tackles; wire cutters, toolbox, grill, charcoal and lighter fluids into the house. A two-week supply of animal feed and medications should be stored in waterproof containers in a safe location. Contact out-of-town friends and relatives and keep them informed of your plans. It will be easier for you to contact them than for them to contact you. Make sure your insurance is adequate and up-to-date. Photograph or video tape all property and animals, and take the photos or tapes with you if you must evacuate. Remember that after the storm all transactions will have to be made in cash and banks and gas stations will be closed.